Are you infatuated with those delightfully cute chusky puppies? Perhaps you’re wondering if a chusky pup could be the right breed for you. Welcome to your complete guide to the chow chow husky mix. Also referred to as a chowski, the chusky is made up of a chow chow and a Siberian husky. In this piece, we will examine these breeds individually to help you decide if a chow chow x husky will make a good pet. Firstly though, let us look at the controversy surrounding designed breeds. A puppy whose parents are two different purebred dogs is known as a first generation mix. There is much debate over whether the breeding of designer dogs is ethical or not. Some claim that the gene pools of purebred dogs have become so small that it is almost impossible to breed without passing on inherited illnesses and disease to the next generation. Others vehemently oppose this view and maintain that pedigree lines must remain pure. Whatever you feel about the subject, crossbreeding has been around for a long time and shows no sign of abating. The debates and arguments continue. But in order to see if this specific first generation mix might suit your lifestyle, we will now look at the parent breeds of the chusky in turn. The chow chow, which originates from China, has a fascinating history. Dating back over 2,000 years to the Han Dynasty, the chow chow can be clearly seen in sculptures and pottery of the period. It is said that they may go back even further having ancestral links to other spitz-type dogs from East Asia and the Arctic. Rumor has it that in the 7th century, a Chinese emperor kept several thousand chow chow dogs for his 10,000 workers. Also thought to provide food and clothes for Chinese peasants in ancient times, other roles have included guard dogs and hunters. The first chow chows seen in the west came into the U.K. in the late 18th century and were exhibits at London Zoo in the 1820s. It was not until Queen Victoria, a renowned dog lover, procured a chow chow that they became popular on western shores. The breed was recognized by the UK Kennel Club in 1894 and later by the American Kennel Club in 1903. Originating from the Northeast of Siberia, the husky was known locally as the Chukchi, named after the Eskimo people who bred them. They were used as endurance sled dogs but were also valued family members living freely amongst their masters. Due to their remote location, the Siberian husky remained a purebred for hundreds of years. The husky is the fastest and most agile of the sled dogs and was adept at hauling loads over frozen ice fields in polar conditions. It was in 1925 that the Siberian husky caused a stir when the remote Alaskan village of Nome suffered from a diphtheria epidemic. Teams of dogs hauled life-saving medicine to the isolated village, preventing numerous inhabitants from perishing. The breed was recognized by the American Kennel Club in 1930. In common with the majority of mix breeds, the origin of the chusky dog is unknown. The only way that we may gain insight into a hybrid breed is by discussing its parents. Considered to be medium in size, the adult chow chow will typically weigh between 45 to 70 pounds. Height-wise, anything between 17 to 20 inches at the withers is standard. Also of a medium size, the height of the husky is usually between 20 to 23.5 inches with a weight range of about 35 to 60 pounds. A full-grown chusky is likely to be a medium-size dog, ranging somewhere around these variables. Known for his lion-like mane and frowning impression, the chow chow is certainly striking. Although he has a somewhat stilted gait, his muscular and sturdy body moves rapidly and with ease for long periods. There are two types of coat, rough or long-haired and smooth. The rough coat is seen the most. Colors can be red, black, blue, cinnamon and cream, with a number of shades possible in the reds and cinnamons. Remarkably, the chow chow has a black tongue and mouth, which he shares with few other creatures. 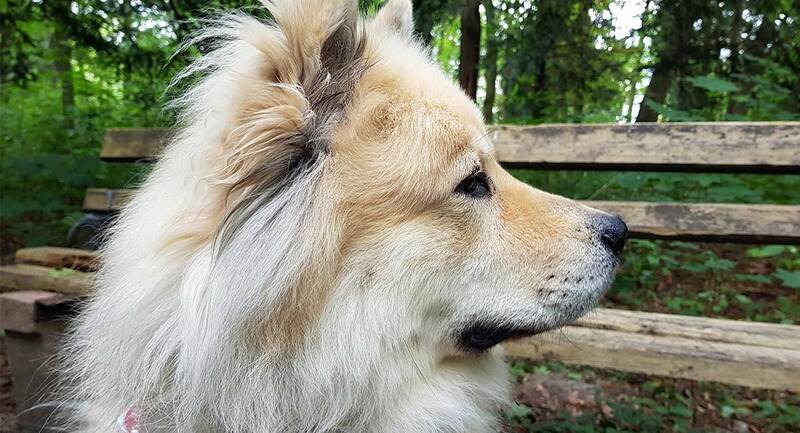 The tail is another devilishly handsome feature of the chow chow. It should be high-set, broad at the base and tapered toward its end. Light-footed and lean, the Siberian husky is a powerful yet graceful breed. The expression is responsive and bright if mischievous. His well-furred body has a double coat, with a straight top, smooth and medium length. All colors from pure white to black are accepted in the show ring. The patterns or markings on the head of a Siberian husky are said to be as individual as a fingerprint and are often visually stunning. The fox-like tail should be cheerfully arched over the back when at attention and trailing when working or at rest. It is important to remember that, being a hybrid, a chow chow and husky mix could take after either of its parents or look like a combination of both. It is pretty safe to say that he will have a beautiful fluffy coat. The chow chow’s personality is sometimes compared to that of a cat. He is independent, dignified, stubborn and can be aloof. He is devoted to his owners and has guarding tendencies if a stranger enters his territory unexpectedly. The breed is happy to meet visitors, however, if introduced by his owners. Early socialization is crucial to form a well-rounded adult. The Siberian husky has a friendly temperament. He is gentle and affectionate without being submissive. As a pack animal, he likes to be with his family group but is not a one-person dog. He is unconcerned by strangers, and his sociability makes for a hopeless guard dog. This breed generally gets on well with other well-adjusted dogs. Do note that a chow chow cross husky may take on the personality of one of its parents or a bit of each. The chow chow has an abundant double coat so regular grooming is a must. He should be brushed a minimum of twice weekly, more if at all possible. This will keep the coat in good condition to avoid become matted, as well as completely minimizing any dog odor. The chow chow sheds heavily but seasonally so extra attention should be given to grooming at this time. Huskies are relatively easy to keep and are by nature very clean with little odor. Clipping is not necessary, but weekly brushing is a good idea to keep the coat and skin healthy. Shedding seasonally, the husky molts surprisingly heavily during this time. Dental and nail care are important for both breeds, and the same will be true for a chow chow husky. Ideally, teeth should be brushed at least twice each week and nails trimmed as necessary. If you can hear the nails tapping on the floor when walking, they almost certainly need cutting. It’s a good idea to start grooming puppies at a young age so that they become accustomed to being handled and brushed. The chow chow is largely healthy but, as with all breeds, there are some issues to be aware of. The chow chow has a predisposition for entropion, which causes the eyelid to roll inward leading to irritation or even damage. If your pup’s eyes water excessively or are irritated, contact your vet as surgery is often required to treat the condition. 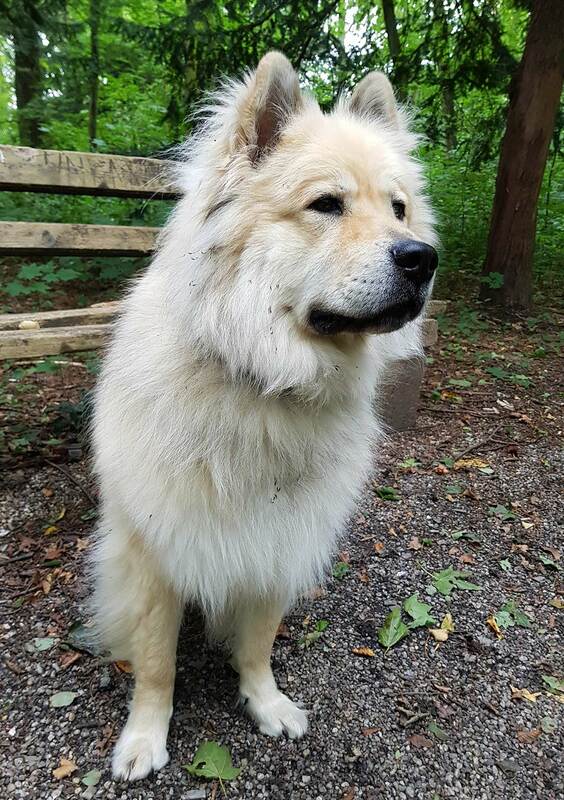 Hip dysplasia and elbow dysplasia whilst relatively uncommon are known to affect the chow chow. These genetic conditions occur when the bones do not fit into the joint correctly. A young dog may or may not show signs of discomfort, but arthritis may develop with age. Another to be aware of is autoimmune thyroiditis, which is inflammation of the thyroid gland. The disorder can usually be treated with medication. Health screening is recommended for breeding chow chows because all of the above ailments can be detected by testing. Thankfully, the Siberian husky is typically a very healthy breed. The main health issues concern the joints and eyes, which we will look at below. Hip dysplasia can also occur in the husky, generally within the first two years of a dog’s life. As with the chow chow, a juvenile dog might experience symptoms or these may show with arthritis later in life. There are three eye conditions known to affect huskies: hereditary cataracts, corneal dystrophy and progressive retinal atrophy (PRA). Health screening is available for these conditions, and both parents of breeding huskies should be tested yearly. The chow chow needs daily walks, but moderate exercise is usually sufficient for this breed. Notably, the chow chow does not do well in heat and should be kept inside as much as possible when the weather is hot. Said to be one of the easiest breeds to house train, the chow chow adapts well to obedience training too. Having said that, their independence will keep them from being a perfect pupil. So it is recommended that owners attend puppy classes. The husky is an athletic dog and needs to be exercised regularly for at least an hour or more each day. As he can be difficult and stubborn in obedience training classes, practicing positive reinforcement training is recommended for this breed. With a high prey drive and an unusually strong desire to run, it is advisable to keep him on a leash when out and about and in an unfenced area. Will a Chusky be a Good Choice for Me? As the exercise needs of the two parent breeds differ, you will need to be prepared for either. The chow chow is by no means a lazy dog, but the husky is undoubtedly more energetic. The chow chow and the husky both do well with children although it’s never wise to leave a child alone with any dog. An older child that knows how to treat animals respectfully would undoubtedly become the best of friends with a chusky. Remember that both breeds shed and require brushing yet generate little if any dog odor. Neither of these breeds likes to be left alone for long periods, and both crave the company of their humans. All dogs can easily become destructive in the house and garden when bored. If you are not at home much through the day, a chusky is probably not a good idea. However, if you enjoy a healthy lifestyle, including outdoor activities, then a chow chow Siberian husky mix could be your perfect companion. How to get hold of a chow chow husky mix puppy is a very good question. They are not recognized by the American or UK Kennel Clubs so you will need to be extremely careful when searching for a puppy. Puppy mills are very real, and devious breeders can appear to be very credible. Always make sure that you see the mother and ideally the father of a litter. The chusky price is difficult to predict. In the U.K., you would probably be looking to pay between £1,000 and £2,000. In the U.S., that would be approximately $1,200 to $3,000. With a chusky puppy, make sure that the breeding parents have good eye and hip scores and insist on seeing paperwork to prove it. We know that it’s hard if you’ve seen a beautiful fluffy baby, but be strong and ready to move on if anything at all feels wrong. That decision could save you a lot of money and heartache in the long run.